Collection>The danish golden age>P. C. Skovgaard>Skovgaard P. C.
Oil on canvas, 39 x 60 cm. Skovgaard was passionate about travelling and went far during his ventures in Denmark. His shorter trips took him around Zealand to locales such as Skarrit Lake, Delhoved Forest and Hellebæk in the north, from where this open-air sketch stems. 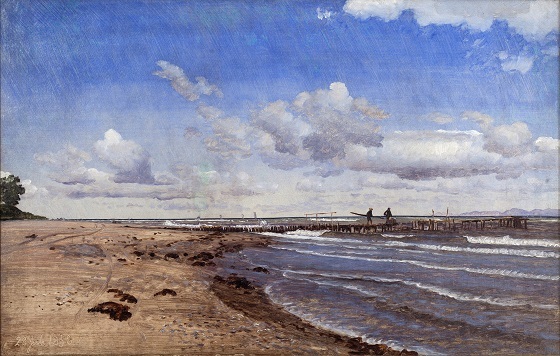 It is apparent how the artist has in constructing the image: From the striated blue sky painted with a broad brush and turpentine-thinned paint, to the clouds modelled with a finer, softer brush, to the tiny figures and the dock just barely suggested as hastily applied patches of unmixed paint. Finally, the date has been scratched into the paint while still wet, 28 July 1858. As a whole, the painting seems alive and one senses how both the sea and the figures are in motion. In Denmark, Skovgaard, along with his artist colleague, J. Th. Lundbye, became one of the most significant National Romantic landscape painters of the Golden Age. For a number of years, he was a professor at the Academy of Art in Copenhagen. Among Skovgaard’s sources of inspiration were Flemish Baroque landscape painters such as Jacob Ruysdael and the French artist Claude Lorrain’s timeless Arcadian landscapes. He mastered both the smaller formats with realistic, impasto depictions of nature and bigger, monumental and detailed compositions. The artist’s favoured subject matter was the Danish beech forest, which he painted throughout his life in countless variations from regions all across the country. Skovgaard’s artistic legacy was primarily carried on through his sons, Joakim and Niels.